which is the first prize in the group’s major fundraiser for the Neo-Natal Unit at Port Macquarie Base Hospital. 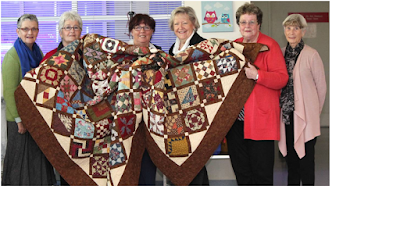 One of the Mid North Coast’s biggest quilting shows will get underway in July with proceeds going to the Neo-Natal Unit at Port Macquarie Base Hospital. The three-day show is regarded as one of the premier craft events on the Mid North Coast and features hundreds of handmade quilts, quilting displays, fibre art, wall hangings and much more. This years raffle quilt (pictured above) is titled 'Farmers Wife' and is the major fundraiser for the Neo- Natal Unit. Classes at this year’s show include Indigo Niche, a beautiful artform of Sashiko stitching and Japanese fabrics, Everything Country and Christmas Decoration. For further information about the Quilt Show, or to support the Timeless Quilters’ raffle, phone 0402 437 604. Java to Japan "The Forgotten Lands"